The Georgia Psychiatric Physicians Association welcomes professional listings and advertisements that may be of interest to our members. Submissions will be posted within three business (3) days of payment being received, and will be up for ninety (90) days. 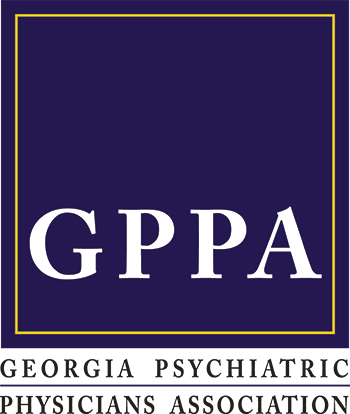 If you are interested in placing an ad with GPPA, please visit our Place an Ad page. Office now available to rent in shared suite in lovely Johns Creek professional office complex. The available space is one of 4 therapy rooms within our office suite, which includes waiting area, business office, bathroom and kitchen/break room. We are all independent mental health practitioners (1 psychiatrist and several therapists) sharing space to keep overhead low and enjoying professional camaraderie and referral opportunities. We would welcome another psychologist or psychotherapist to join our office. It would also be an ideal situation for a psychiatrist or psychiatric nurse practitioner looking to establish, build or move a practice, with our current psychiatrist’s practice often full and offering referrals. Long established psychiatric practice has an office to rent in charming old house in Smyrna. This spacious office overlooks the grounds with a private entrance through french doors opening onto a screened in porch. The present occupants of the building include mental health professionals who share a common waiting, business and kitchen area. Parking is available. Is it your personal mission to provide individuals with mental illnesses opportunities to live fulfilling lives? Do you embrace environments that cultivate learning? You will work with other dedicated professionals who share your passion for helping individuals in need. In addition to the above, what else will this opportunity offer you? - Ability to enhance your clinical skills while working with children and youth with severe mental health and psychological challenges. - Access to Devereux’s Institute of Clinical Practice, Training and Research, and memberships to professional organizations and conferences. - Work with a stable national non-profit that offers a strong support system and is forward-thinking in our clinical practice and research. - Best available, highest quality, low-cost benefit options to include generous Time-Off Benefits. Devereux Advanced Behavioral Health Georgia in Kennesaw, GA (website) provides new hopes, new dreams, and new choices for children, adolescents and young adults struggling with emotional and behavioral health challenges. In this role, as a Psychiatrist, you will administer psychiatric/clinical/medical services and provide appropriate treatment. Additionally, this role will serve as a consultant to Center leadership and staff on medical or psychiatric treatment, and direct treatment activities of staff when such staff is engaged in supporting psychiatric/clinical/medical services.  Full completion of an approved psychiatric residency program.  Board Certified or Board-Eligible Psychiatrist with a current license to practice.  Child psychiatry training and be able to demonstrate relevant treatment competency through clinical experience, continuing education units and referral letters to support these specific skills.  Valid driver's license must be maintained. Emory University Department of Psychiatry and Behavior Sciences is expanding their outpatient and partial hospital programs and has the following openings which can be found at this website link: https://faculty-emory.icims.com/jobs/search?ss=1&searchKeyword=psychiat&searchRelation=keyword_all. Note that the Pediatric Institute is the Child Psychiatry Department and this is way it is listed on the Emory website. This full time position provides approximately one full day for the attending to address administration and academic interests..
We are seeking a BC/BE psychiatrist to serve as an attending in our adult partial hospitalization (PHP) and intensive outpatient programs (AIOP) and to provide some inpatient care. Currently our PHP and AIOP programs see approximately 15 patients daily; patients must be seen weekly by an attending psychiatrist. The psychiatrist would be responsible for the psychiatric care of enrolled patients and serve as leader of the treatment team. The Emory Clinic is interviewing for an academic or clinical Geriatric Psychiatrist who is interested in joining a vibrant team of clinicians, educators and researchers who are invested in providing high quality care in an innovative environment committed to the development of new treatments and educating the next generation of psychiatrists. The qualified candidate will serve as a full-time attending in the geriatric outpatient program of the Emory Clinic. The attending will provide psychiatric care for new patients, supervise residents and advanced practice nurses, conduct quality assessments, attend case conferences and participate in administrative meetings and educational functions. The attending also will have the opportunity to participate in research including research studies in the clinic as well as quality improvement initiatives and/or the development of evidenced-based clinics and specialty treatments. The attending will be responsible for covering inpatient services at Emory as part of the faculty call system. The position will be 80% clinical care and 20% administration and teaching or research. Research or related-funds can offset the percent time for any of these activities. The Child Psychiatrist will be providing outpatient clinical services through the Department's Child, Adolescent and Young Adult program. The ideal candidate will be providing clinical services to a diverse clientele and should have expertise in mood disorder, anxiety disorders, and/or autism. In addition to clinical activity, Psychiatry Faculty are actively involved in clinical research and teaching of residents and fellows. The Department of Psychiatry and Behavioral Sciences at Emory University School of Medicine is seeking a full-time Addiction Psychiatrist to join its outpatient faculty. As part of a growing Addiction Psychiatry Service, this position will offer the opportunity to participate in clinical care and education. Support staff for scheduling and case management will be provided. Clinical outpatient addiction care, teaching and collaboration are priorities for this position. Research or related-funds can offset the percent time for any of these activities. All faculty are encouraged to supervise residents and fellows. Proportional call is an expected clinical responsibility with cross coverage availability for vacations and conferences. Office space will be provided at the newly built Emory Brain Health Center, which includes on-site parking, as well as lab and urine drug screen testing. Successful candidates will work within a multidisciplinary treatment team with expertise in addictions. Services including scheduling and intake coordination will be provided. The position also allows for CME time with monetary allowance, relocation, and an advantageous retirement plan. Correctional Medicine Associates (CMA) has a career opportunity for a full-time Psychiatrist at Stewart Detention Center in Lumpkin, GA. Provide overall direction and leadership to the provision of mental health at the facility. Provide physician collaboration for the Psychiatric Nurse Practitioner. Must have a Georgia medical license, DEA and BLS or ACLS. Must be able to pass federal clearance. Compensation is competitive and we provide your malpractice insurance. Other benefits include medical, dental, vision, PTO, holiday pay, 401(K), flexible scheduling , bonus structure and relocation. Please visit our website at correctionsprofessionalcorp.comor contact Tatia Hobbs at [email protected] more details. Crossroads Christian Counseling Center Inc.
One of the most highly regarded outpatient psychiatry practices in North Atlanta, GA suburbs is seeking an additional psychiatrist/psychopharmacologist to treat adults in our Marietta and/or Alpharetta GA location. Opportunities to provide TMS/Ketamine, practice integrative/holistic psychiatry, and participate in clinical research trials available as well. We provide the highest quality, evidence-based care in the southeast and are actively involved in research and teaching. Our strong reputation in the community guarantees a busy patient load with a variety of treatment modalities. See out website at www.psychatlanta.com for more info on our practice. Salary, income guarantee, or practice overage are all options. New clinical trial to evaluate the efficacy of intranasal ESKETAMINE FOR MDD and Suicidal ideation started and opened for enrollment. Subjects must be a man or woman, 18-64 years of age with diagnosis of Major Depressive Disorder and has suicidal ideation with intent. Subjects should be willing to be in inpatient for minimum of 5 days at Peachford hospital for stabilization and then be in clinic for 3 months. Exclusions: Bipolar disorder, Schizophrenia, drug or alcohol use, or Borderline personality disorder. Subjects are allowed to take treatment as usual during the study, study drug is add-on treatment. STUDY PAYS FOR INPATENT STAY and STABILIZATION. CONTACT US FOR REFERRALS OR VISIT WWW.ABRTRIALS.COM FOR MORE INFORMATION. More Than Healthcare, Correct Care Solutions. CCRS is a national public healthcare leader caring for underserved patients in correctional settings, psychiatric hospitals and residential treatment facilities. Our Psychiatrist assumes responsibility for the admission, continuing care, and discharge of patients; provides leadership to the multi-disciplinary treatment team; and participates in performance improvement and other activities. Long-established group of four independently practicing Sandy Springs psychiatrists and psychoanalysts seek a fifth psychiatrist to rent vacant office, share modest office expenses including secretary. Pleasant ambiance in quiet but accessible location just north of Buckhead. Corner office is elegant, spacious (16X20), affordable. Shared space includes waiting room, bus. office, kitchen, break room, 2 bathrooms. Ground floor of small, attractive colonial office condo complex, Hardeman Square, on Roswell Rd. 4 min. inside I-285. Free parking. In the heart of one of the fastest growing and most affluent corridors in the U.S., especially suited for starting or expanding a psychiatric office practice. Immediate occupancy or owners flexible. Devereux Georgia is seeking a full-time medical director with experience in child psychiatry to lead their team of qualified mental health professionals. We are also seeking a contracted child psychiatrist 1-3 days per week. Devereux is a 100 bed residential facility located on a 40 acre campus in Kennesaw, GA, providing services to youth ages 10-21 years. We offer a broad range of educational and evidence based treatments in a nurturing environment using positive behavior interventions and support. Devereux offers a competitive salary with an exceptional benefit program. Georgia Bio Behavioral Associates is an established and expanding outpatient psychiatric practice with locations in both Marietta and Dunwoody, GA. We specialize in adult and adolescent psychiatry and we are currently seeking a full or part -time Nurse Practitioner or Physician's Assistant to join our team. The provider must be able to work independently and collaboratively and have excellent verbal and written communication skills. Major duties would include new patient assessments, medication management visits, and psychotherapy. Very busy and expanding psychiatric/addiction practice in Marietta area looking for individual to join. Established patients and new patients to help someone grow the practice. Cost sharing arrangement, credentialing and marketing included. Office is conveniently located to I-75 and downtown Marietta. Schedule is very flexible and very supportive/competent administrative staff. Newly remodeled fully equipped office space, and we offer a cost sharing arrangement. We do have patients to give for someone starting out or seeking to build their practice. We are a well-established, thriving and rapidly growing single specialty multidisciplinary private mental health practice based in Greater Atlanta/Grayson, GA. We have a unique private practice opportunity available and are seeking a Board Certified or Board Eligible Adult, Geriatric and/or Child and Adolescent Psychiatrist. Work involves a mix of inpatient, outpatient services. All age groups of psychiatric populations served from child/adolescent through geriatric. We collaborate with and provide services at two of the private psychiatric hospitals in the community. The ideal candidate should be committed, hard-working, and a superior team player. Psychiatry Residents welcomed to apply. Competitive salary and full benefits.